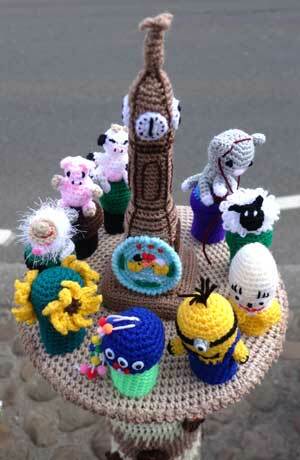 More photographs of the Thirsk Yarnbombers work. It all began at the end of 2015 when a local lady called Sam heard that the Tour de Yorkshire was coming through Thirsk and put a message on Facebook. To keep it brief, within a week word got round and a small group of knitters and crocheters had expanded to over 100 who decided to 'make a few flags' to hang around the town. 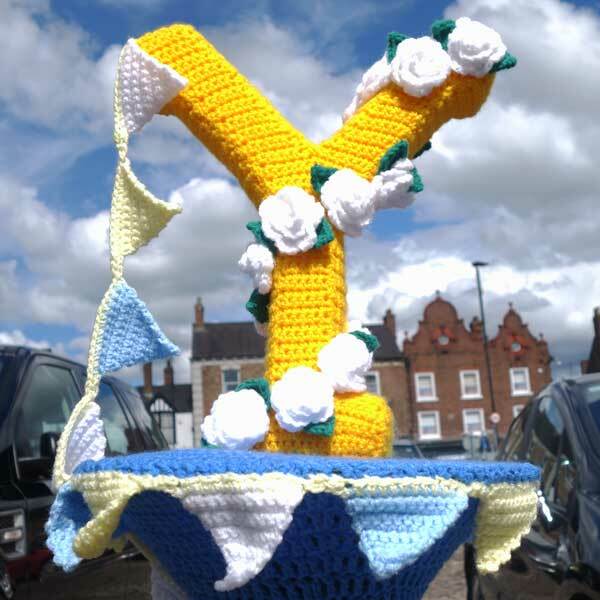 That group became much bigger and the ideas much more imaginative and by the time of the race in April 2016 over 300 people had become involved, knitting and crocheting. On a dark and cold night (3°C at 2 am) a week before the race, the Yarnbombers of Thirsk donned dark clothing, balaclavas, and masks and ‘bombed’ the whole of the town – bollards, blankets round tree trunks, wonderful creations hanging in trees, knitted flags fastened along fences and even every shop had a knitted item relating to their particular trade fastened onto its door handle. The next morning the word got round very quickly and after a short sleep the Yarnbombers walked round the town to see lots and lots of people taking photographs, and chatting and all with big smiles on their faces. Since then there’s been no stopping them. They have decorated a carriage on a Grand Central train at Kings Cross Station, London, been on the Welcome to Yorkshire stand at the Great Yorkshire Show and ‘bombed’ an articulated lorry and a tractor. Thirsk Market Place has been decorated several times more, including a celebration of 100 years since the birth of Thirsk based Alf Wight, known throughout the world as James Herriot the author of ‘All Creatures Great and Small’ and other stories about his life as a country vet. Probably their most moving knitting and crocheting work was for Remembrance Sunday in 2016 when many more than 35,000 red poppies were made and stitched onto yards and yards of army camouflage netting which was then draped along the walls of St Mary’s Church, All Saints RC Church and the Methodist Church in Thirsk and St Oswald’s Church in Sowerby. The poppies also hung down like a waterfall on clear netting from the top of St Mary's. Some of these poppies were made by people who had heard of the work of the Thirsk Yarnbombers, but some had no idea even where Thirsk was! The poppies were brought here or posted, many anonymously. 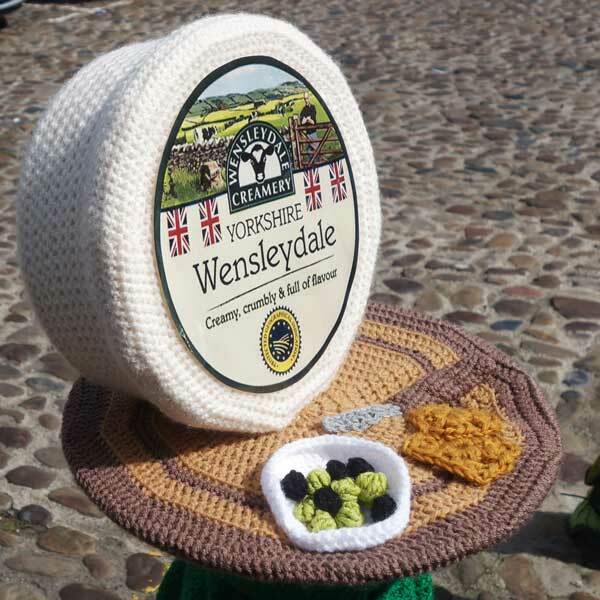 Some were crafted on a beach in Normandy and others in Australia and brought back to Thirsk! This time the decorations are to celebrate Yorkshire Day 2017 and we hope you enjoy them. The group relies on donations and support from local businesses. If you wish to make a donation then please take a leaflet from Thirsk’s information office.